We are praying for the innocent victims and their families and friends of tragedy during Boston Marathon 2013. Hope for a speedy recovery for the injured victims. This is another delicious challenge for this month Baking Partner’s. If you are new to this blog, baking partners are a group of home baker’s who love baking and intend to learn from each other. You are also welcome to join if you love baking and want to improve your skills. Take a look at here. This month challenge theme was” Cheesecake”. Reeni of Cinnamon and spice and everything nice. ” suggested cotton soft Japanese cheesecake/ Chiizukeiki and Sweatha of Experiments, Emotions , Experiences with Food.suggested eggless mango cheesecake. 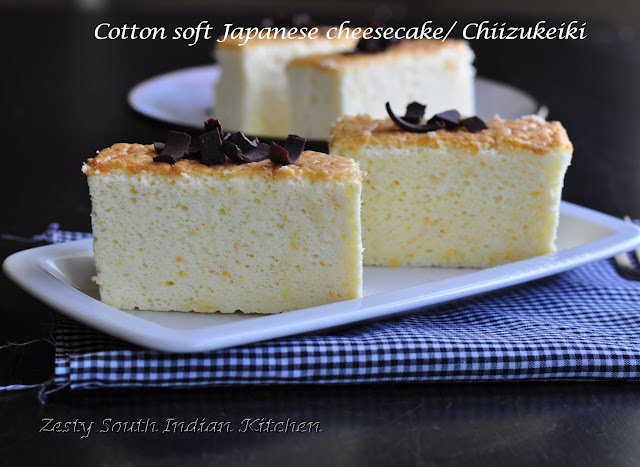 The eggless cheesecake version is a non baked cheesecake; I tried cotton soft Japanese cheesecake/ Chiizukeiki. I didn’t know the Japanese name of this cheese until one of my fellow baking partners Samantha pointed the name of this cake Chiizukeiki. My hubby is crazy about cheesecake, and he always wants me to try cheesecakes recipes at home. I too love cheesecake, however getting perfect cheesecake is always tricky. My first few attempts of cheesecake making attempts were failure, and gradually I am getting it right. 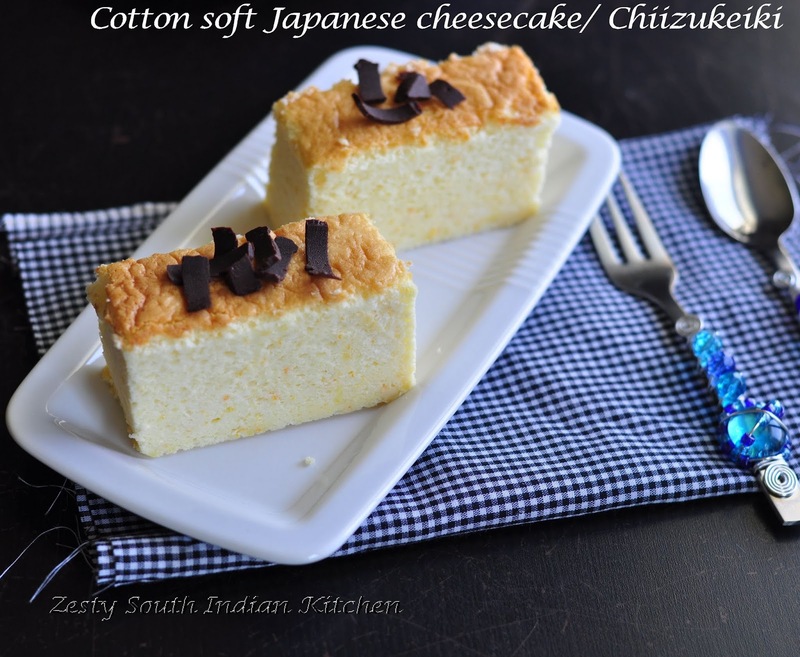 So when I saw this cotton soft Japanese cheesecake and read the horror stories of failure to get one right, I got scared. Motivated from the words of my hubby “if you don’t try how you will you get it right”, I decide to give it try. This cheesecake has an amazing texture; it is soft like cotton, and it is an intermediate between cake and cheesecake, and it is not custardy like normal cheesecake or moist like a cake. This cheesecake is lifted by eggs and cream cheese, and supported with little cake flour and cornstarch. Since this cake is heavy on eggs, in order give flavor I used orange juice and zest of orange. I was happy to see the spec of orange zest in every bites of this cake. If you don’t want to flavor your cake with orange, you can use lemon, lime or even vanilla. For a whole 8 inch pan, the recipe needs 6 eggs and 9 oz of cream cheese. First I thought of making individual serving in muffin tin, but later drop that idea and made the cheese cake in loaf pan and also halved the recipe. I found every step in the recipe is critical to get the final texture. 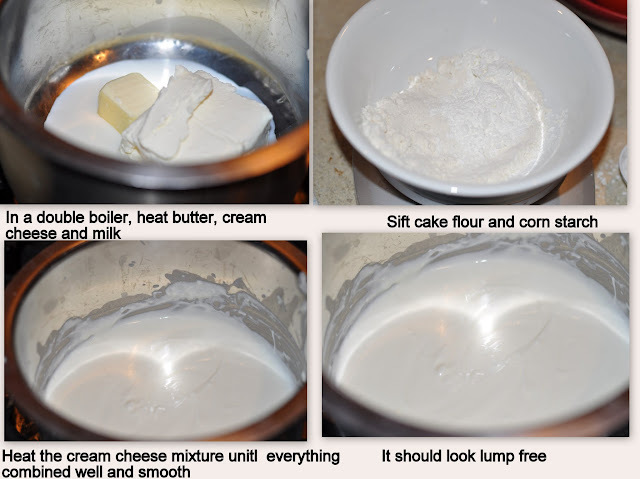 I used a double boiler to to heat up cream cheese, milk and butter. Then beat the egg yolks with orange juice and orange zest and set aside. The egg yolk mixtures were incorporated into the cheese mixture and again mixed in with flour mixture. Finally the lift of the cake is given by the beaten egg white which is gradually incorporated with distorting air bubbles trapped inside the egg whites. . If you want to know about the chemistry behind the beating of eggs read from here. When you are beating the egg white, you are denaturing the proteins in egg white, if you beat until soft peaks, the proteins are partial denatured but it still retains some of their elasticity. The partially denatured protein strands are surrounded with air bubbles and when heated, these proteins were fully denatured and solidify, creating a protective wall so that air bubbles don’t burst. Result in the final product light and fluffy in nature. Since I didn’t use spring pan, I lined the loaf tin with lots of parchment paper and buttered them well. I used a water bath to cook the cheese cake, as it maintains the moisture in the oven. Once the cake is done, I left the oven door slightly ajar with a spatula and cooled the cake in oven to prevent them from shrinking too much. Once cake was cooled in the oven for 10 minutes, I removed the cake and cooled it again for about 30 minutes at room temperature before slicing them. I used semisweet chocolate curls to decorate the cake. We enjoyed a lot. Try it you are looking for a new variation in cheese cake. 1. Melt cream cheese, butter and milk over a double boiler. Cool the mixture. 2. Sift the cake flour and corn flour and set aside. 3. Mix orange juice, orange zest and egg yolks well and set aside. . To this orange yolk mixture fold in the flour, the corn flour and mix well. 5. 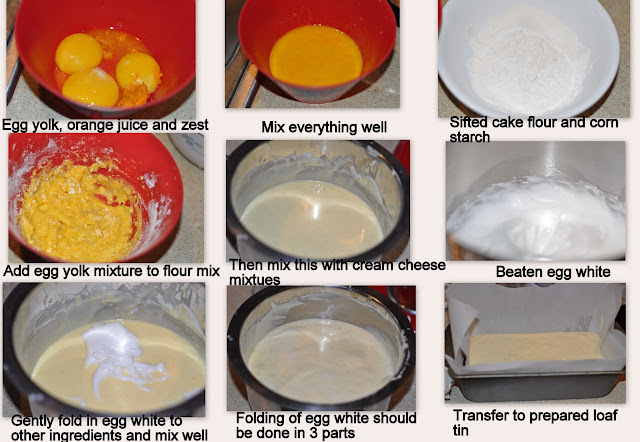 Add the cheese mixture to the orange-egg yolks-flour mixture and mix well. To this gradually fold in egg whites in three portions. Pour into a loaf pan of 9x 15 loaf tin. (Lightly grease and line the bottom and sides of the pan with greaseproof baking paper or parchment paper). 6. Bake cheesecake in a hot water bath for 1 hour 10 minutes or until set and golden brown at 160 degrees C (325 degrees F). 7. Allow to cool the cake with oven door ajar for 10 minutes. Then remove the cake from the oven and cool it for another 30 minutes. 8. You can enjoy the cake if you want or you can refrigerate the cake for 2 hours before serving. Soft porous moist cheese cake. Would like to have a bite now, so yummy! Looks softy and yummy cake. Thanks for sharing with us Swathi. This is awesome. I am making it this week. so soft and wonderful clicks Swathi!!! 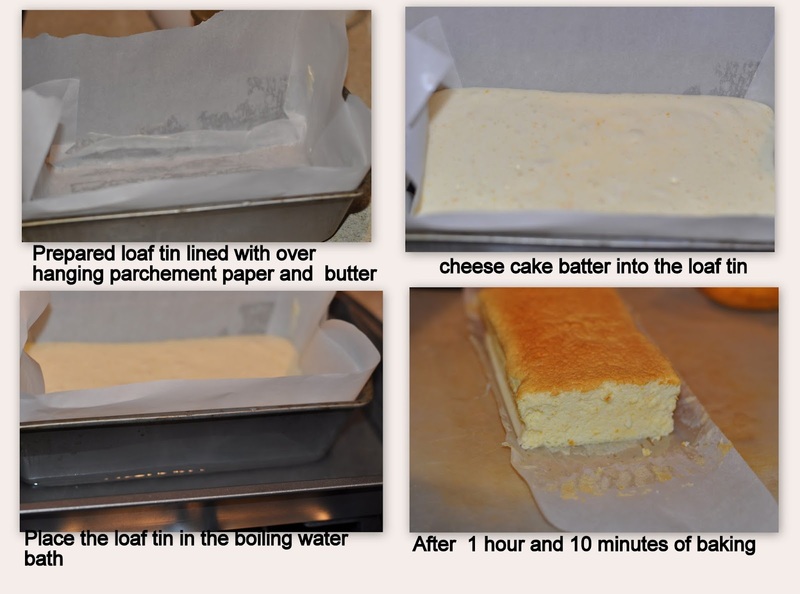 Simply loved your idea of baking in a loaf tin with overhanging parchment!! It truly is a cotton soft cheesecake!! Delicious combination cheese cake, looks tempting! Wow ! looks super soft ! Oooh, that looks really delicious. So soft and yet so delicious! wooooow… swathi, please can i have a pc??? omg!! its raining cheesecakes here..urs luks soo super soft . loved it! Wow Swathi, such a beautiful cheesecake, just want to grab and eat it. Beautiful clicks and explanation. Delicious and well explained as always. I agree with you Swathi,it’s really a different type of cake. I like it very much. Your cake looks delicious. Please, send me the mirror link. 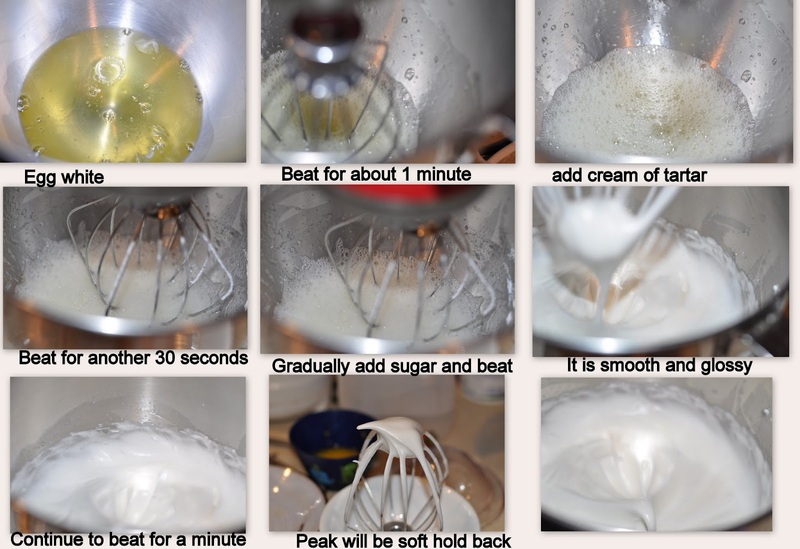 The cake looks wonderful and nice step by step clicks. super soft swati.. nice clicks.. Very yummy looking! You did so well with your Japanese Cheesecake, Swathi! 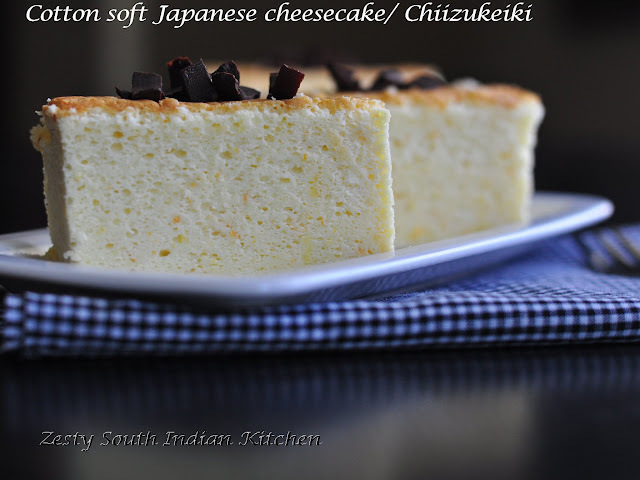 Never knew it was also called Chiizukeiki,this was great challenge Swathi,thoroughly enjoyed. It looks so good, it doesn’t need anything really on top! How delicate! wow stunning cake so good swathi. Such a professional click. Looks so soft.wonderful recipe,thank you for the challenge.Just now linked it . Perfect texture of the cheese cake. You guys are all making me drool here with your stunning creations. Beautiful Swathi! I am so glad you liked it! Thanks for letting me pick it out. Ooucch!!! So good, so fabulous and so trilling with the stunning visuals. My prayers are there for the victims. Lets also pray for those effected by the earthquake in Iran and the latest in Papua New Guinea. Perfectly made cake, Swathi.. Love the texture..Enjoyed this month’s Challenge..
I’m going to bake featherlight cheesecake too soon and glad that I can learn all these great tips from you. wow!! perfectly soft and spongy…sure it will glide in our mouth!!! 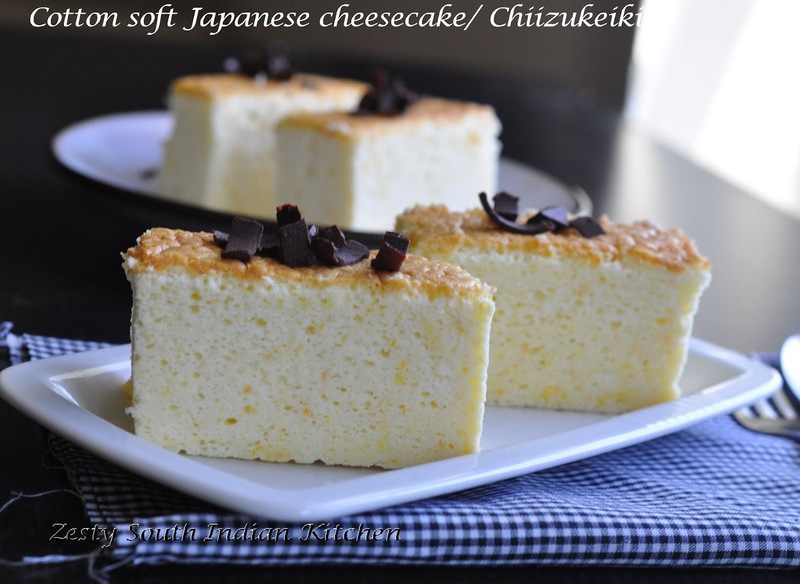 never had Japanese style cheesecake..looks so soft! These look so soft & moist – absolutely delish! awesome clicks n a very inviting soft spongy cake.. drooool!!! Luce delicioso y hermoso como una esponja quiero ir por varios trozos,abrazos y abrazos. This is an awesome recipe. I tried it a while ago and loved every bite of it. Your cheesecake looks lovely. 1 oz. each of cake flour and corn flour? You have two different gram measurements, so how can that be? It is typo I corrected it now Diane, Thanks for notifying me.